New York based design duo Mike Eckhaus and Zoe Latta are challenging traditional notions of design by privileging materiality over aesthetics. Address resident fashion critic Jacob Rosengren attempts to unpack the significance of this changing approach to thinking about garments. Watching the spring summer 2016 shows taking place in New York, London, Milan and, at the moment, in Paris, it’s impossible to get excited about anything. There are no dresses that make hearts stop for their sheer, unequivocal beauty. There are no jackets that demand attention because of their geniusly engineered design. Just more of the same in different shapes and sizes. Except for the work of one New York based label that is offering the opposite qualities of what good fashion is visually supposed to be, by creating ugly and, in theory, badly designed clothing for purpose of putting materiality first. Founded by friends Mike Eckhaus and Zoe Latta, the unisex brand that carries a combination of the designers’ surnames as its title, is perhaps the most noteworthy new label at the moment. With echoes of Helmut Lang-ian complex simplicity that excited everyone a few decades ago and the awkward design aesthetics championed by J W Anderson more recently, Eckhaus Latta is creating a look that, at first glance, looks raw and nondescript, but on closer inspection reveals an abundance of design oddities that have the ability to makes the viewers question the very notion of fashion. 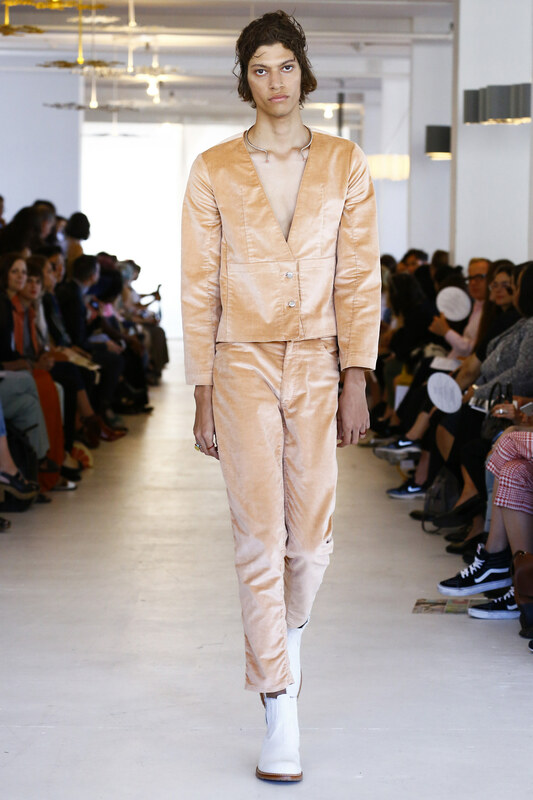 Eckhaus Latta’s approach to creating garments is more akin to conceptual art practice without resulting into something that is just statemental This starting point sets their design in an alternative direction where some of the basic principles of gendered clothing, such as aesthetics and construction, have to be rethought. There are no grand inspirational narratives behind their collections. There are no avant-garde muses, glamorous women, uptown ladies nor downtown girls – or men for that matter – as an aloof cliché of a customer that they might, metaphorically, be dressing. Instead, the result is less of a collection for either men or women, more of a selection of objects that function in a variety of ways – based on the wearer. Mike Eckhaus, who originally studied sculpture, and Zoe Latta who trained as a textile designer, see materiality as the central component of their work. In the tactile and stately feel of the garments they have created can be seen the traces of their differing educational experiences. 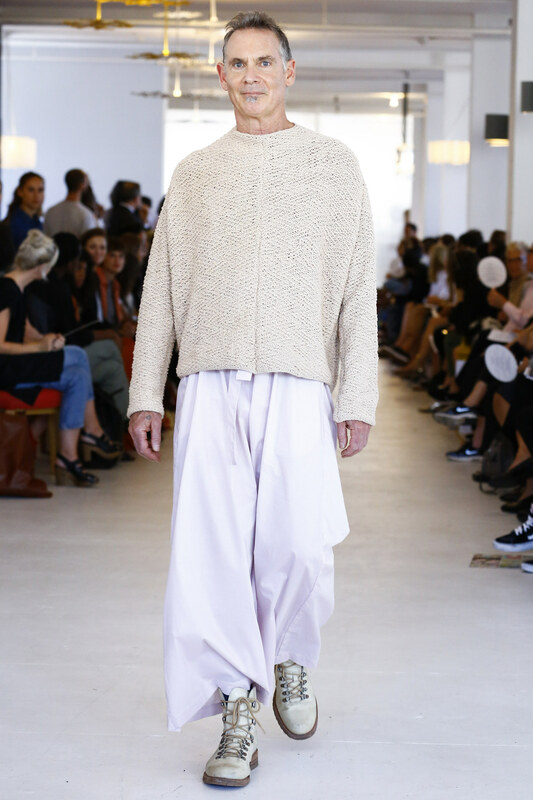 And perhaps because of the duo’s lack of formal fashion training, compensated by their understanding of material and form, Eckhaus Latta’s collections manage to simultaneously go directly against everything fashion stands for, whilst producing something that perfectly captures the spirit of the time. Take, for instance, look 26 from their spring summer 2016 collection presented in New York a few weeks ago. This outfit contains a litany of design sins that make up something distinctively virtuous. The two-piece casual unisex suit not only fits very badly, it also appears poorly proportioned: just look at the pull in the under arm, the flatness of the chest area, the awkward trouser hem and sleeve lengths and the relationship between the sleeve hem width against the rest of the sleeve, for example. Despite projecting soft tactility with its velvety surface, the fabric is inappropriately stiff for the shape. The cut seems unconsidered as sleeve seams are uncomfortably positioned to be exposed and the jacket front fashioning is anything but harmonious. The colour in turn, is unmentionable. Despite of all the faults, it is clear that the designers are not talentless or ill-equipped at what they are doing. Add together everything you see in the look 26 and the result is starting to create not just a new exciting design vocabulary, but a language that feels right for fashion now. By not conforming to traditional ideas of harmony and proportion, Eckhaus Latta is asking us to think about the materiality of clothing. What it’s like to wear a jacket or a pair of trousers? Or, how is clothing supposed to make you feel as opposed to look? These questions, whilst on the surface seem obvious when we think about clothing, are in fact a radical departure from traditional design thinking that favours aesthetics over all the other senses. This approach to thinking about feeling as opposed to mere appearance is extended to the casting as well. Instead of uniform surface beauty, the garments are presented on one of the most the diverse array of models cast for a show this season – reminiscent of Bodymap shows in the 1980’s featuring models young and old, tall and short, mundane and extraordinary. Together with the clothing, this combination presents a powerful message that resonates intellectually but also realistically. Against the wider context of the fashion system, Eckhaus Latta’s collections might come across uncomfortable for their unapologetic visual bluntness. The designers’ radical change in thinking about fashion requires time and space. However, as a way of approaching garment construction, the most intimate of design disciplines, this approach is long over due. Leading with look 26, Eckhaus Latta has put the materiality of the garment along with the bodily sensation they produce first and it will be just a matter of time when the aesthetic norms will follow this new way of creating fashion.